Does everything Big Machine Records touch turn to gold? New country band Eden’s Edge sure hopes so. The band just released their first single to country radio and the track is making an impact in the early stages. The song Amen is about small town love and the band is hoping it becomes a big hit this summer. The story of Amen is about a girl that loves a boy. For the moment he’s been with someone else, but now he’s come to his senses and realized his previous girlfriend was not right for him. Now the girl telling the story can finally share her feelings for the boy with him and see if things work out for the small town romance. My first impression of the song is that it’s catchy. With a new group being introduced to the country world they usually need something snappy and catchy to get the attention of the picky country audience. I’d say this track has just that and should make a good first impression on the listening audience once it makes a bigger appearance on radio stations this spring. The overall sound of this group is something unique. It reminds me a bit of current country trio The Band Perry. Even more than that resemblance I think the band reminds of the sound of country in the ’90s. I can’t put my finger on exactly where that sound is coming from, but the production on this track has that ’90s country sound with a neo-traditional sound. The lead vocals sound like a country singer from the ’90s era like a Trisha Yearwood or even Pam Tillis. There is that country, rural vocal quality that could only come from someone authentic. 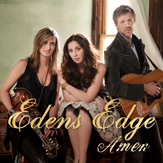 It will be interesting to see how Eden’s Edge does with Amen this summer. My bet would be on it being a hit song. There is a history of country fans growing attached to songs about love and being with someone even though everyone else says it can’t happen. Country people love an underdog story and I’d say Eden’s Edge has captured that feeling with their new song and even with their own story.